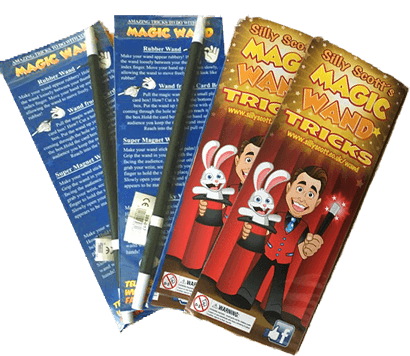 Silly Scott Magic Wand Packs offer something different and creative for the party guests to take home rather than the box standard party bags or sweet cones. After watching Silly Scott's amazing magic show the children are always buzzing about magic as they leave the party and what better way to say 'Thank You' for coming by sending your party guests home with a memorable and exclusive magical gift. The wand pack contains a magic wand and glossy colourful card insert with instructions/diagrams of 4 easy to do tricks that you are able to do with the wand itself, sealed in a transparent cello bag. The Wand inside the Birthday Child's Wand Pack is slightly different to all the others being a little bit longer & thicker and also branded with my Silly Scott logo & Magic Words (see pics below). The wands are 10" long, making the pack 10" x 4" with beautiful gloss instructions, Video tutorial link, all packaged in a clear sealed bag. These wands are VERY popular, they are a whooping 2ft long and 3" wide. 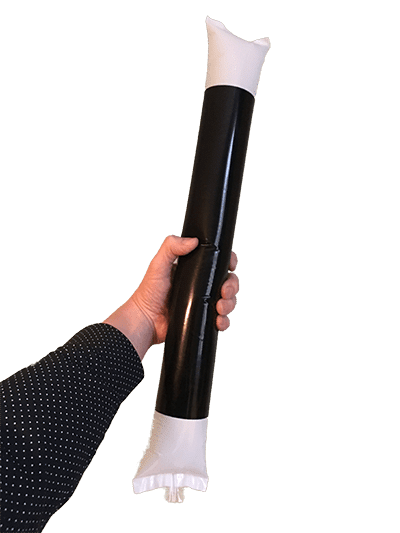 Very Easy to inflate using the supplied plastic straw and blowing them up like a balloon, they are self-sealing, so no pump and no knot is necessary! Here are the benefits of having Silly Scott's party favors. You don't have to buy extra packets of items, because they don't have the right number you require. You don't have to sit there for hours breaking open all the packaging and then fill the Party Bags. If you buy sweet cones, the sweets inside are VERY cheap quality so that the seller can make a profit, and VERY bad for the children's teeth! and the best bit of all with Silly Scott's party favors is you only pay for what you use on the day. So your not stuck with them if guests do not turn up, which also saves you time and money!! Children really love to have their face painted, and we always have great pleasure watching the children's expressions when they look in the mirror. 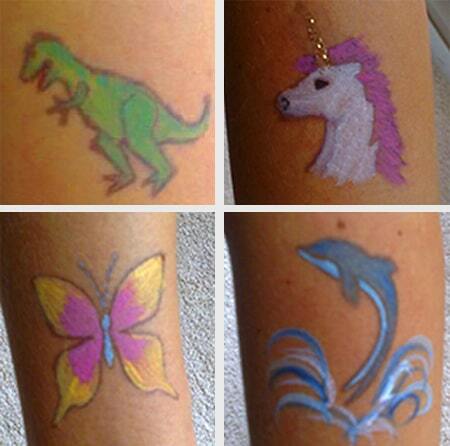 From Fairies to Super Heroes, Pirates to Butterflies, Dinosaurs to Princesses. Silly Scott's has a fantastic team of face painters that can bring any child's face to life with one of their amazing designs. Silly Scott's team of professional Face Painters all have friendly personalities and an incredible artistic flare, which makes them the ideal team to persuade even the coyest of child to have their face painted or maybe a small tattoo stamp on their arm or cheek. Silly Scott's professional team of Face Painters always keep up with all the latest trends and have a wide selection of different faces to choose from, they also specialize in Temporary Tattoo's and Burpo Stamps (which are great for cheek/arms or younger children and are filled in with colour using ordinary face paints) Adding this to your party or event can be at a special discounted fee if booked with one of Silly Scott's party packages. Face Painting is ideal for children's birthday parties, fete's, fun days, corporate events, charity events, store promotions, Christmas parties, holiday camps, girls pamper parties, christenings, Pre-Schools, Holiday Clubs, Football Clubs, the list is endless. So why not try a face painter at your event. Foam stamps are approximately 1.5" at the widest point and perfect for the cheek, hand or arm of the average child. The stamps are applied to a black face paint block and then directly onto the child's face, arm or hand, they are then coloured in with normal face paints. Stamps are very easily removed with either a baby wipe or soap and water. 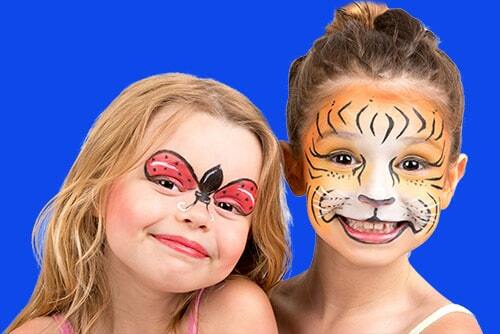 Face Painting Stamps are ideal for busy events like Fetes, Shopping Centres, Fun Days, Corporate Events, Garden Centres or anywhere where there is a big crowd and a fast turnaround is needed . They are also great for younger children's parties, as they do not cover the whole face and can also be used on the arm, cheek or hand of the child. 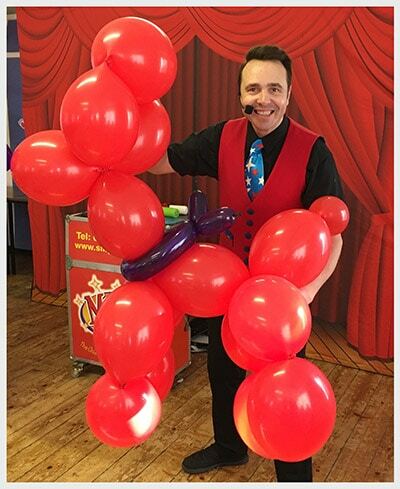 Balloon Modelling & Twisting is the ideal entertainment at Corporate Events, Fun days, Fete’s, Store Promotions, or an add-on for Birthday Parties. 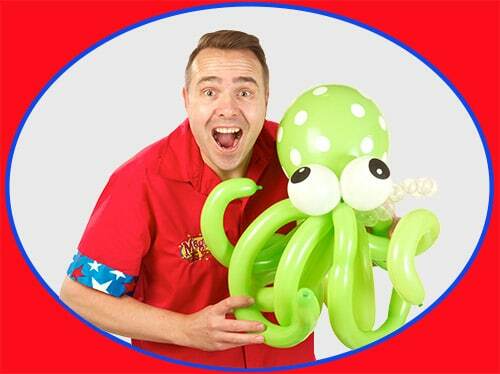 Silly Scott has a VERY talented team of Balloon Twisters who will with stroll around your Venue, Event or Party Guests making some truly amazing balloon model creations. We also offer captivating show-stopping creations for shop window displays, table decorations, product launches or as a bespoke gift for a birthday or anniversary ect! Balloon Modelling also pairs fantastic with Face Painting, as this can entertain the children who are waiting to get their face painted or maybe queuing for any other reason like Santa's Grotto ect.